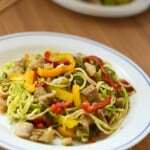 Fish stir fry zoodles recipe – fish fillet chopped into piece and coated in a dry rub before being stir fried and tossed with vegetable noodles (zoodles).Fish stir fry zoodles recipe – fish fillet chopped into piece and coated in a dry rub before being stir fried and tossed with vegetable noodles (zoodles). 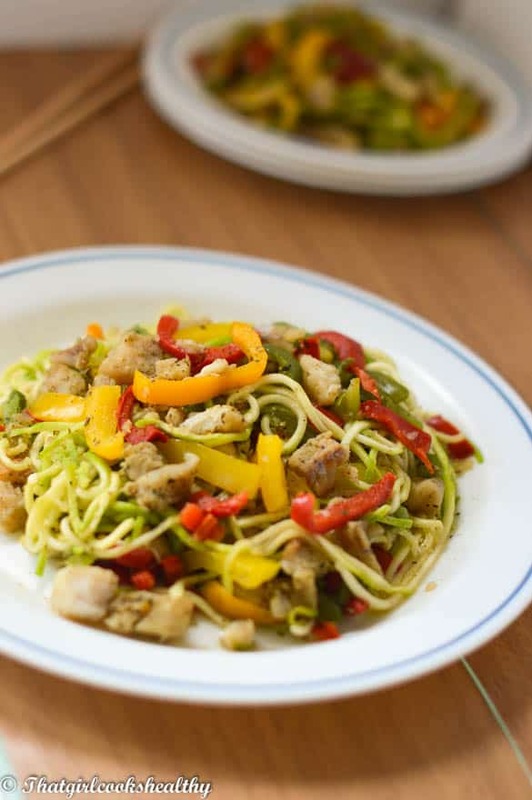 Fish stir fry zoodles recipe – fish fillet chopped into piece and coated in a dry rub before being stir fried and tossed with vegetable noodles (zoodles). 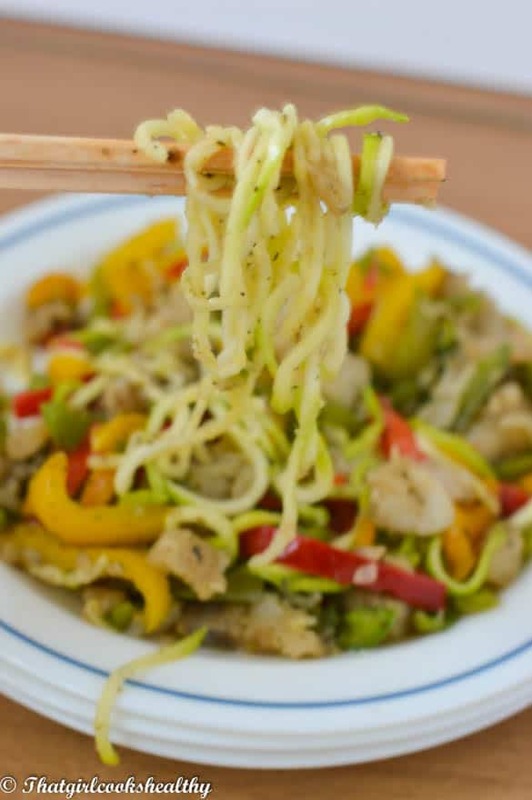 Fish stir fry zoodles? What on earth is Charla talking about? I’m referring to the new terminology for wheat free noodles. Years ago I went through a period where I ate copious amounts of pasta, noodles etc.. all made from wheat and often felt bloated shortly afterwards. At the time, not being too concerned about diet and nutrition, ignored the symptoms which explained why I ate wheat in large quantities. As the years went by I began to pay close attention to this bloated feeling, documenting what I ate as a means of identifying the cause. It soon became apparent that wheat was the culprit. After this shock discovery I had to amend my diet because I clearly had some type of sensitivity to wheat. Removing wheat from my diet isn’t easy, although I can tolerant some wheat like spelt flour. For the most part I try to avoid it for the sake of my health. Last year my mother brought me a spiraliser which I was really pleased with. I’d been studying this kitchen tool for awhile and would sometimes mention it during our conversation. I intended to treat myself to it but she beat me to it. Ever since there’s been no turning back. I’ve made every single vegetable noodle you can think of. 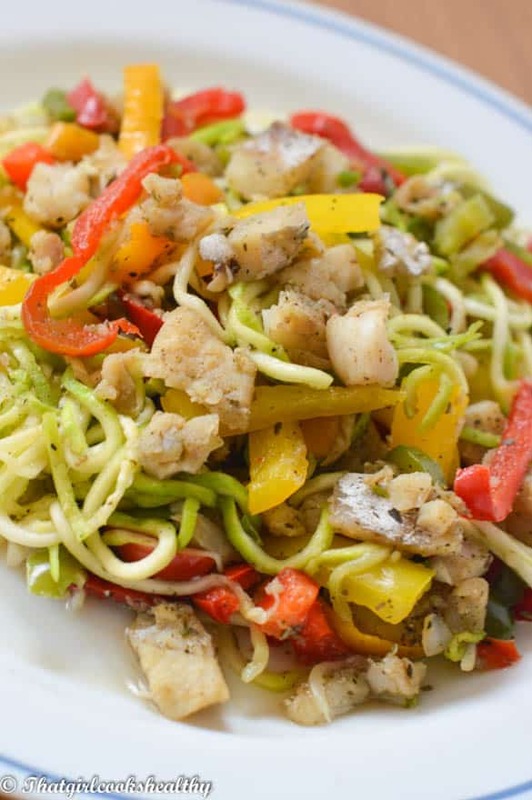 Like this zoodle fish stir fry recipe – grain free and healthy veggie noodles. That’s great for the gluten intolerant and anyone who wants to eat a low fat high protein meal. An interestingly thing about making noodles from zucchini, is the bitter after taste which may people complain about. Almost to the point where some never re-attempt to make zoodles again. When I cook I like to be systematic with the order of cooking steps. Just leave the zoodles to release its bitterness and season the fish. 1 tsp of garlic powder *optional. Why not impress your friends and family at a dinner party with this vegetable stir fry. 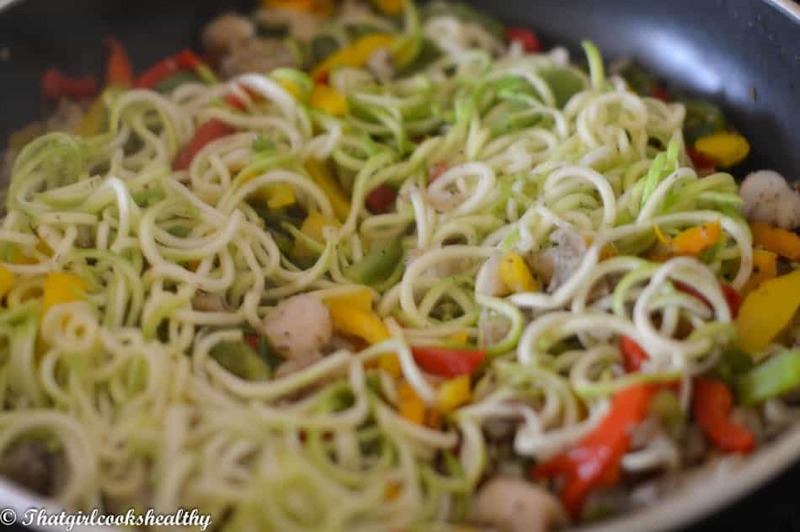 Fish stir fry zoodles is…………. Low in fat and high in protein – great for those on a protein enriched diet or looking to loose weight while eating something that’s deliciously nutritious too. As you can see it’s really not that difficult to make a zoodle stir fry, it all comes together with precision and ease. Go on what are you waiting for, get in that kitchen and start cooking. 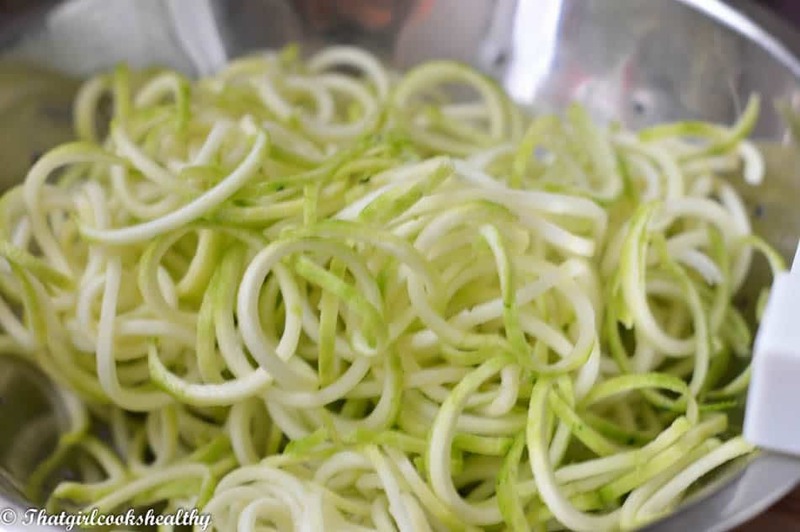 Start off by using the spiraliser to create vegetable noodles. To do this simply use a sharp knife to scrap the skin off the zucchini, it should come off quite easily. Then wedge the zucchini in between the spike and insert it into the metal protruding. Rotate the lever clockwise until the zoodles exit the other side. Put the veggie noodles into a colander, massage with the pink salt and set aside for 10-15 minutes. In the meantime, season the fish with the premade seasoning. After the given time you will notice the zoodles begin to sweat. At this stage wash and drain the zoodles. 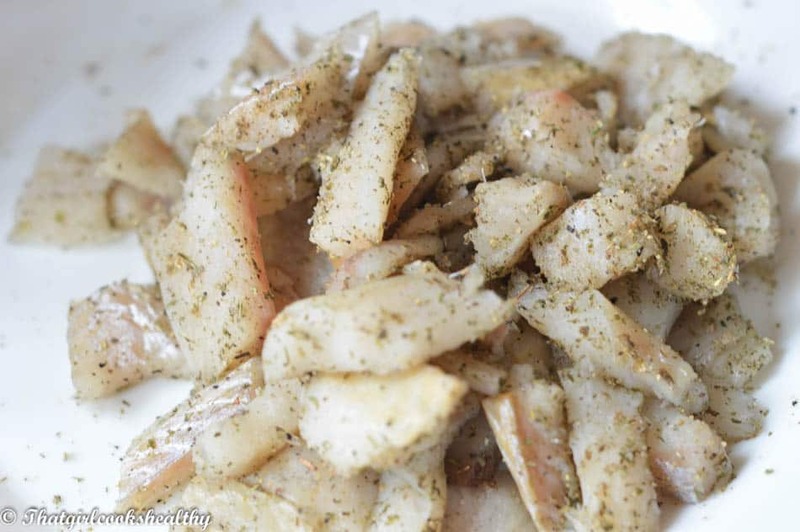 In a heavy duty pan (can use wok) pour in the coconut oil on medium heat and pan fry the fish. Ensure to toss and manoeuvre fish for an even transparent sealant. Do this for one minute. 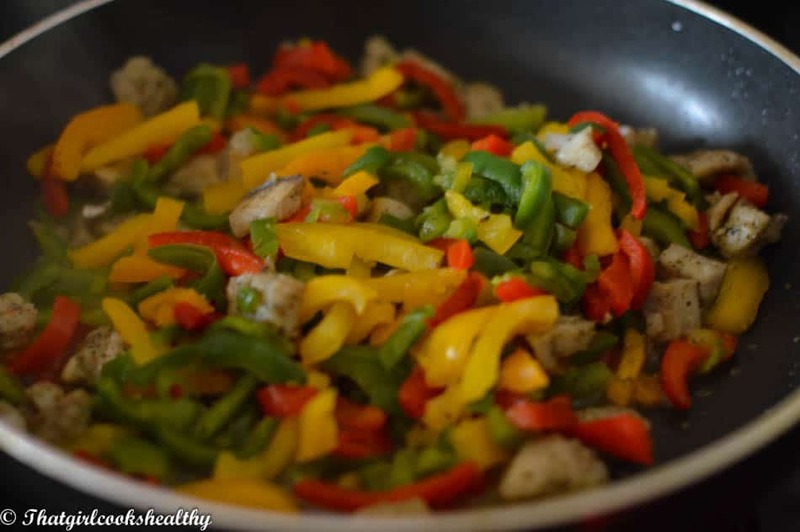 Now add the bell peppers, again quickly pan fry those and give a good toss for another minute. The flavours should begin to seep through to the peppers with the juice from the fish and veggies coating the frying pan. Finally add the vegetable noodles and reduce the heat to low, cover the pan and allow to steam for 3-4 minutes. As the noodles are fragile allowing them to steam rather then stir will retain the body. Once steamed thoroughly, remove from stove and serve accordingly. Ensure to omit the bitterness by adding the pink salt to the zoodles and set aside. Great recipe! I’m really getting into this pasta alternative plus it’s a really good way to get your greens in! Hey Yasmeen, thank you. It’s a great method for parents to get their kiddies to eat their greens too. The bitter aftertaste almost scared me off, so thank you for such a brilliant tip! Lovely recipe too! Thanks Ken. I had the same unfortunate experience when I first started making zoodles. I couldn’t keep this awesome tip a secret from my readers.